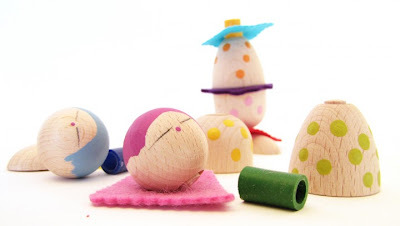 I'm not quite sure how long these toys have been on the market but I was immediately drawn to their minimalist Kokeshi-type faces and pretty painted bodies. 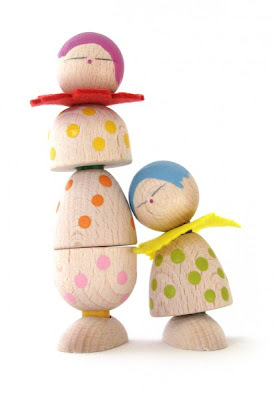 The Gemini wooden and felt peg-doll playset is made in Germany by award-winning toymaker Kellner Steckfiguren. It is distributed by Naef and can be yours for 16.50 EUR, (excl. tax). A happy find for Colour My Monday, and perhaps one to bookmark for Christmas? les jouets Naef sont tous magnifiques ! I love these and the fact that one is Gemini even more. Hope you are having a wonderful Monday.